5 Steps: How to Design Engaging Chatbot Conversation Flow? Did you ever order a pizza? Or search for a recipe online? You might have also attempted online shopping. But have you tried doing the same stuff with chatbots? From shopping to weather forecasts to customer support chatbots have made everything easy. With simple conversations, you can practically do everything (seek information, make purchase etc.). These chatbots can take the user from intent to final checkout in a matter of seconds. As a matter of fact, Chatbots aren’t as smart as they are perceived by users. What seems like a simple conversation between a machine and human is actually a very complicated flow. To make these bots superb in human communication they need a predefined flow of communication. This flow is designed to handle every possible communication the user can make with the bot. Without this predefined flow, bots will irritate the users leading to a negative buying experience. In this blog, we will study the exact steps to create a conversation flow for a chatbot so that engages users and delivers value. Marketers and executives who want to create a chatbot for their business. Curious people who want to know the art behind the automated chatbot conversations. A chatbot conversation flow aims to perform a specific task for the user. Whether it is to direct him to purchase, solve a query or give some information. To make an efficient conversation flow for a chatbot you need to know the beginning and end of the conversation. The middle part of the conversation flow is for you to define. A good chatbot should always function on some key deliverables and those should be communicated to the user. To make this flow efficient you should know exactly where you want to take the user. Once you have identified that you can move to next step for creating chatbot conversation flows. Ideally, you shouldn’t disguise your bot as a human. But that doesn’t mean that it cannot have a personality. A good chatbot should be likable just like your brand. We are not accustomed to filling a questionnaire for every purchase we make. By giving your bot a character you can make the communication more engaging and interactive. The bot’s personality should resound with your brand image. The dialect and tone need to be consistent to give your bot a character. 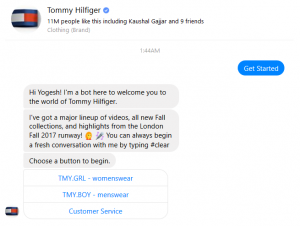 For example, in case of an apparel company the bot can communicate like a personal stylist. This will give your bot a competitive edge. A simple conversation can take many different turns. There are many possible answers which the user might give for a specific question. For example, if you ask the user about the kind of apparel he wants to buy, then his possible answers can be casual, formal, semi-casual, party, beach, sports etc. You will need to tailor the communication to suit individual answers. As soon you start defining the conversation flow you will notice that the communication is soon becoming complicated. This is where flowcharts can come in handy. You can use google docs drawing tools for basic flows or opt for tools like Botmock to create advanced flowcharts for different chatbot platforms. As we discussed earlier, there can be many possible answers to a single question. To guide the user through the buyer’s journey you should narrow down the scope of answers. For instance, in our earlier example instead of asking about the kind of apparel the questions could be, “What are you looking for?” Options – Casual, Formal, Semi-casual. Depending upon the choice you can later ask for more detailed questions like size, occasion, etc. Chatbots are not as smart as humans in making conversations. Giving limited options is an effective way to avoid glitches and smoothen the conversation flow. By narrowing down the choices you can easily avoid confusion and inappropriate responses. Do remember that giving limited options doesn’t mean that you force the user to a specific path. You should allow the users to communicate their needs precisely. By following these steps, you can easily create a chatbot for your business. 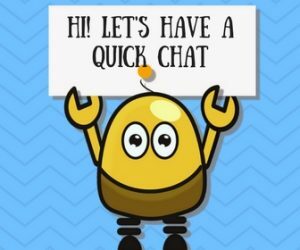 If you are looking for a marketer to create a conversation flow for your chatbot then feel free to get in touch. I have worked closely on this technology and would be able to give your bot a shape that can help you engage and convert users.